Hong Kong is one of my favourite Asian cities. I find it to be such a indescribable mix of old world British culture with modern Asian sensibilities. The mix doesn’t exist anywhere in the world, so it’s well worth a visit. Many of you might find yourself in Hong Kong on a layover to onward destinations such as Thailand or India. Get out and away from the airport if you can – it looks more like a shopping mall than an airport (hint: give yourself time to find your gates. They’ll be hidden behind a jewellery shop or a wine stone). No matter how long you have, check out one of my top 10 recommendations. Standing on the waterfront in Kowloon, across the harbour from Hong Kong itself, it looks like the Hong Kong skyline could touch the sky and wrap around the earth. It’s simply an incredible sight – pictures do not do it justice. But at 8PM every evening, the skyline starts to dance – to a wee light show! It’s slightly cheesy, but it is kind of fun, and a great opportunity for photographs. You can watch to music from the Kowloon waterfront, or try to get on a Junk Boat that departs a half hour before for an on-the-water view. Not many tourists hit this place, but it’s very interesting. Today it is a beautiful urban park with waterfalls, gardens, and peaceful settings. But it was once a lawless place, stuck in between Chinese and British rule. Massive skyscrapers were packed into this tiny square space, the Walled City, and inside black market trade like prostitution and dentistry (yes, illegal dentists – go figure) thrived. It must have been something to see back then. An exhibition in the the park explains the history. Night Marks are a BIG deal in Hong Kong – I can’t work out whether locals are buying as much as the tourists, but it is an experience in sensory overload. Dealers shouting out deals to you, bars and cafes intermixed with the stalls, lights, noises – it’s a bit crazed. 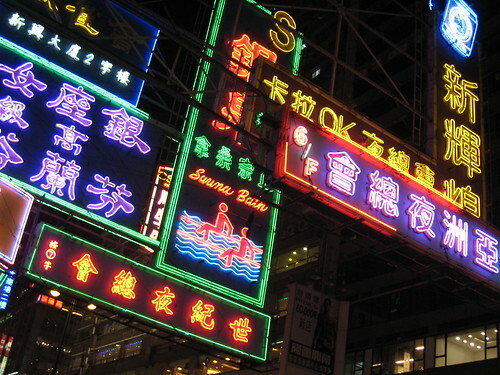 Temple Street was my favourite, but in Kowloon there are several, most busy in the afternoons and of course at night. 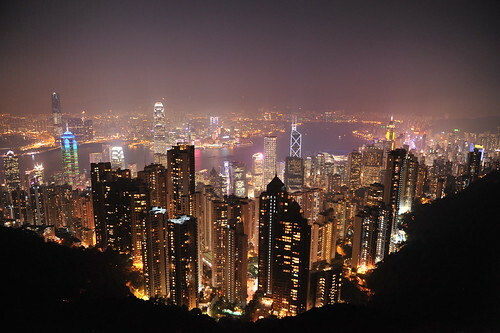 Pictured above, the Peak is one of the classic viewpoints for visitors to Hong Kong. As you can see, it gives you a great visual on how the city of Hong Kong took shape. Warning – the smog often clouds the view. You can take the Peak Tram to get here, and if you can stomach all that smog, there are a couple of walking trails up here. One of the largest Buddha statues in the world, the Tian Tan Buddha is an incredible sight to see. However, what’s more interesting is to explore this island, Lantau. It’s almost completely deserted except for fishing villages and this random Buddha. Be sure to walk past the Buddha and down to the Wisdom Path, which is a short but gorgeous walking trail. Similar to the Lantau experience, many don’t realise that Hong Kong island is pretty quiet except for the harbour area. Stanley is about a 30 minute bus ride across to the other side of Hong Kong island – the ride itself is quite interesting, and Stanley – with its small set of shops and beach waterfront – makes a perfect daytrip. This might sound weird, but there are a huge set of escalators that help commuters get up/down the central area of Hong Kong. Along much of the Escalators are a series of restaurants, pubs and bars – most of them pretty lively. It’s a meeting place for locals, and it’s a great place to sit with a drink and watch the commuters go by. Only in Hong Kong. Hong Kong’s oldest temple, Man Mo was one of my favourite temples as compared to the many others you’ll find. The ceiling is covered in coiled rings of smoking incense, and the whole place has a weird vibe in the air. You’ll often see priests and other officials quietly disappearing down hidden corridors and doorways. This is the party area of Hong Kong; let me rephrase that – this is the biggest party area. There are just hundreds of bars and restaurants hidden down alleyways and up discreet stairways. Every night it seems folks are getting their groove on with music blasting out into the streets, and everyone sampling many of Hong Kong’s great cocktails and beer selections. 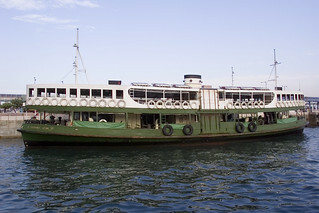 Last but not least is Hong Kong’s well known tourist attraction, the Star Ferry – one of the original forms of transportation across the harbour. The ferry is very cute, it’s cheap, and it is effective – the crossing time is just 10 minutes or so, and you get to just sit back and relax and get some great views of both Kowloon and Hong Kong. What’s not to like?